Why should all puppies go to school? By five months of age much of your puppy’s personality has been determined, so it is very important to begin a class prior to this age. Early puppyhood is a critical time for socialization and learning. This time will set the stage for the rest of your puppy’s life. This is truly a once-in-a-lifetime chance to show your puppy how to confidently relate to other puppies, unfamiliar people, and strange sights, sounds, and events. Reserve your puppy’s spot today in this limited-enrollment class. For pups 8-18 weeks of age at the start of class. Basic obedience to get your pup focused and following your direction using positive reinforcement and rewards (we never use scary or harmful punishment!). Problem solving to make short work of housetraining, and to stop your puppy from using you– and your furniture– as a chew toy. Problem prevention to ensure your pup grows into an adult dog you can truly enjoy– friendly, relaxed, well behaved, and fun. Off-leash puppy play to teach critical dog-dog socialization and communication skills. Important skills such as bite inhibition (developing a soft mouth). Your pup will learn to control biting by playing with dogs his age. Appropriate games to play with your puppy that are both fun and teach your puppy self control. We are now including the AKC S.T.A.R. Puppy program at no additional charge! The AKC S.T.A.R. Puppy is an exciting program that includes teaching specific useful skills and is designed to get dog owners and their puppies off to a good start. Show off your skills learned in class with certification! You want a fun, easy-to-live-with adult dog. That starts here! Before five months of age your puppy is much more open to experiencing new things, so it is very important to begin a class prior to this age. Early puppyhood is a critical time for socialization and learning. This time will set the stage for the rest of your puppy’s life. This is truly a once-in-a-puppy’s-lifetime chance to show your puppy how to confidently relate to other puppies, unfamiliar people, and strange sights, sounds, and events. He needs to learn to adapt to the world around him and feel at ease. It is crucial that this developmental stage is used wisely! Let us help guide you. You want a dog that pays attention and listens to you, and has good manners. That’s why it’s important that you continue to bring your puppy to school for the full 6 weeks of socialization and learning. We work on attention, recalls, sit, down and stays with increasing duration, distance, and distraction. We will also teach leave it, send to mat, polite greeting and discuss resource guarding, housetraining, mouthing, and other important issues. 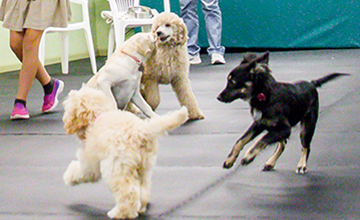 Socialization and off leash puppy play are always an important part of this class. You want your dog to feel comfortable around other dogs. A puppy that is calm around other dogs becomes a dog that is easy to bring places or even walk in your neighborhood without issues. That is why puppy play is an important part of the class. During social play with other puppies, the puppy learns the meaning and the appropriate use of canine communication. Social play serves as the practice of etiquette in which the puppy learns the rules of social behavior—such as bite inhibition. Through social play, young animals improve their ability to interact properly with members of their own species, learn typical communication skills, learn to control their aggression, and form and deepen social bonds. Dogs do not have an innate understanding of how to interpret and react to all canine signals. Although puppies are born with the physical prerequisites for communicative signals, they must learn the meaning and the correct use of such signals. The majority of the puppies in class will integrate nicely into the playgroup. There may be one or two that have some difficulty and we will try to modify any fearful behavior in gentle, supportive ways. Socialization done correctly outside of class is critical in your puppy’s emotional development. Here’s how to do it right. Positive (not scary for your pup) exposure to new places, faces and other animals should continue well past the Ideal Puppy class and into social maturity at around 3 years of age. If the exposure is not reinforced your puppy will lose this critical advantage that began in class. Eager to start? Great! Here's what to bring. These are some of the things you will need to bring with you to class. Small soft treats. Bring lots (a whole baggie full)! The size of the treats should depend on the size of the dog, but in general, each individual treat should be no larger than your fingernail. In a new, distracting environment, you want extra special, high-value treats. You want small soft treats that are easily chewed and immediately swallowed. You can bring several different kinds in snack bags. Some good things to use for training treats are string cheese, low-fat hot dogs, homemade liver treats, cooked chicken, liver, or roast beef, cut into very small pieces. In addition, you can also bring “pre-made” treats such as Zukes, Buddy Biscuits soft treats, Lean Treats, etc. Clicker. I recommend one that has an opening to attach a wrist coil so it’s easy to hold and manipulate. We have clickers and wrist coils for sale if you need them. Treat bag. These are nylon bags which either clip onto your pants or come with a belt to hang around your waist. The treat pouches may also have a pocket to hold the clicker. The best ones open and close quickly and securely with one hand so treats are quickly accessible and don’t drop out easily and distract your dog. We offer good ones for sale. Tug toys. Please bring one or two of your dog’s favorite. Plain buckle collar or martingale, or harness (absolutely no choke chains or pinch collars). You may have your dog on a Gentle Leader Head Halter or in an Easy Walk harness in addition to a regular collar. Soft, 6-foot lead (cotton webbed or soft leather are nice). No retractable leashes please. Mat for your dog to lie on and to teach go to mat. This can be a fleece crate mat, low-pile bath mat (with non-skid bottom is great), yoga mat, etc. It should more than fit your dog when he or she is lying down. Water bowl (hey, learning is thirsty work!). We have a water fountain. Stuffed Kong. Great for keeping your pup occupied during demos. Go to kongcompany.com/recipes/. We have many of these items at Lucky Dog, including treat bags, treats, tug toys and clickers. Please come to class about 10 minutes early to purchase what you need. You should wear a good pair of sneakers or comfortable shoes. Our training techniques are completely positive; we use a lot of food incentives, combined with clicker training for many concepts. Accordingly, please feed much less than usual before coming to class. Your dog will be more responsive if he is a little hungry. Also, you may want to cut down on your dog’s food a little as he will be getting a lot of calories from his training treats and you don’t want him to gain weight.